Welcome to the Barony of Tir Ysgithr! The Barony of Tir Ysgithr is the oldest of the seven mighty baronies in the Kingdom of Atenveldt. We are located in what is known modernly as Tucson, Arizona and its surrounding suburbs. The group was founded in 1973 and has flourished throughout the years with many talented armored fighters, skilled artisans, and tireless workers. 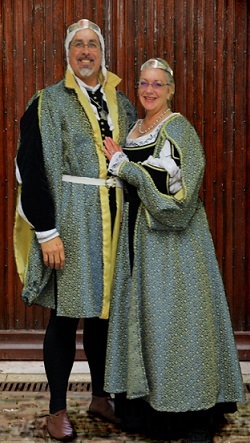 Our Barony is currently headed by Baron Brendan and Baroness Tigra who serve as our reigning nobility. In addition to taking care of the needs of their populace, they bestow baronial awards to those deserving recognition. The Barony hosts arts nights, archery practices, bardic circles, the occasional meetings, and a weekly Fighter Practice–a town square type gathering open to all with an interest in these Current Middle Ages–each Tuesday evening at the Southwest corner of Reid Park in the heart of town. The College of St. Felix (a SCA College Club at the University of Arizona) is also affiliated with the Barony of Tir Ysgithr, and hosts a Fighter Practice & Meeting on Thursday nights. You can find more information about this group using the link above. Please join us as we make history in the Barony, known fondly as the Gem of Atenveldt!